I follow several Vloggers and one of my favourite is Jessica Lorraine who lives in Australia. 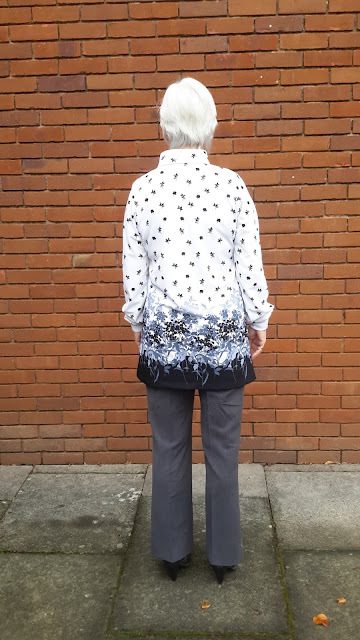 She has recently launched a challenge called Sew My Style 2018 and I was taken by the January pattern. 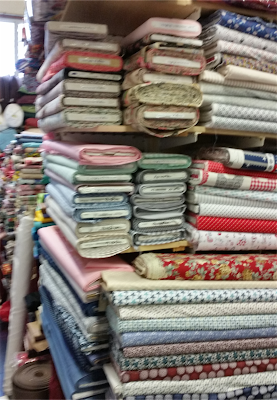 Basically there are 12 patterns from Indie pattern makers who offer a different one each month at a discounted price. 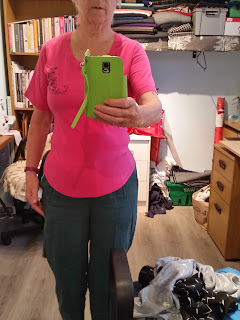 The first one, January, was the Sunny Top / Dress from Friday Pattern Co.
Now you are all aware that I nearly always use my Sure-fit Designs body Blueprint but I have a new goal this year. Don't get me wrong, I haven't forsaken SFD but I need to push my horizons somewhat. 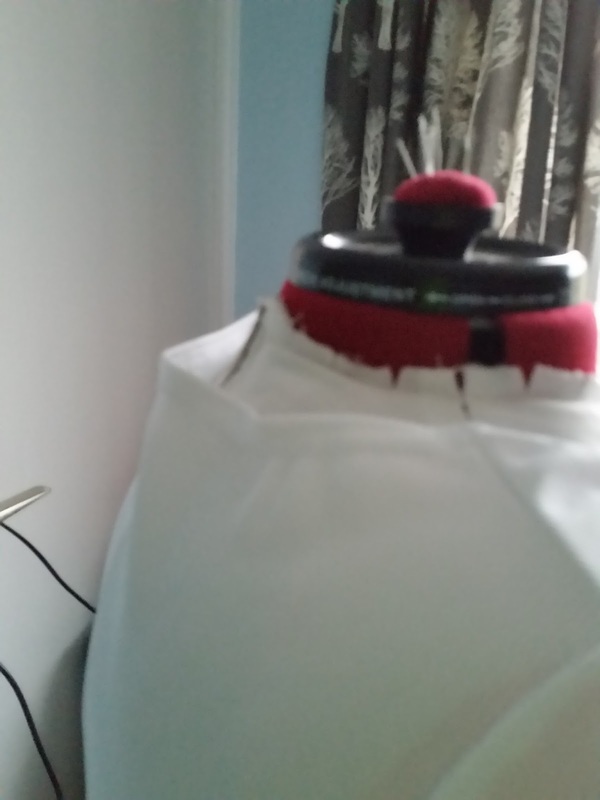 I have spent a lot of time making clothes that fit using SFD and it works. I have trousers, jeans, shirts and tops but I am not a natural designer and looking through my wardrobe I have come to the conclusion that it's boring and predictable, only the fabric choice seems to show any sort of design element apart from the occasional embroidery. The Sew My Style challenge was supposed to launch me into a direction of using pattern designers instead of self drafting but this first pattern did nothing toward that goal. 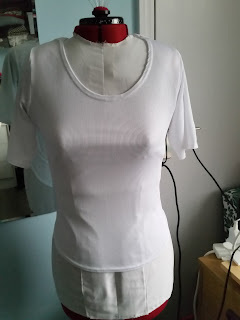 My first attempt was using a white stretch rib left over from another project to make a wearable muslin. After downloading the PDF pattern and sticking it together, I cut the medium size. 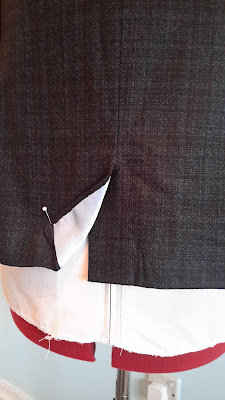 The pattern had no sleeve notches marked and the method of construction could have been a lot better. 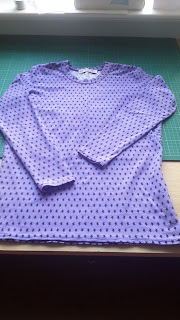 This is meant to encourage beginners but I know from experience with knits especially, that attaching the sleeves 'flat', before sewing the sleeve and sides seams in one go is much easier and produces great results but the instructions would have you sew the seams first and then struggle to fit the sleeves in after. 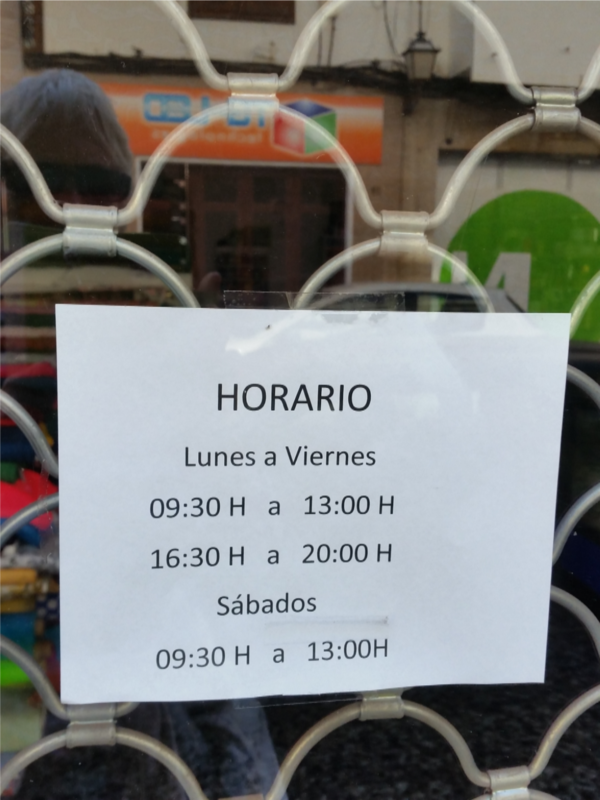 The pattern itself did not look like the picture. 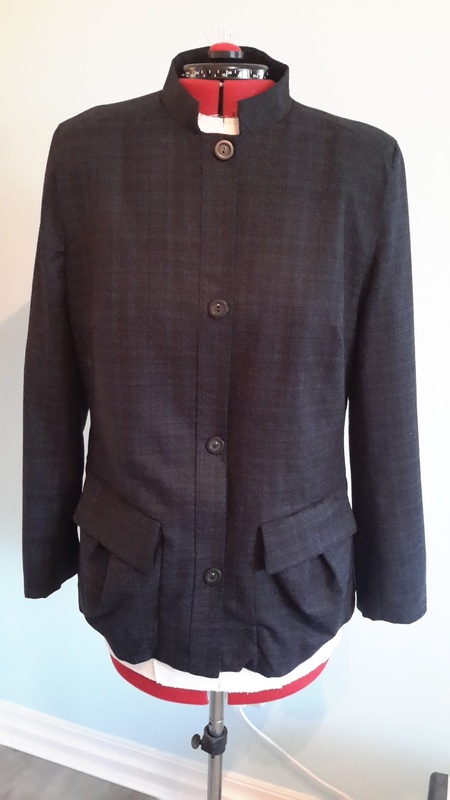 The sleeves were far too baggy and the back neck gaped as you can see in the photo. I took the sleeves in by quite a large amount and they are still larger than I would normally expect a T-Shirt to be. I put a couple of small darts in the back neck and altered my pattern accordingly. 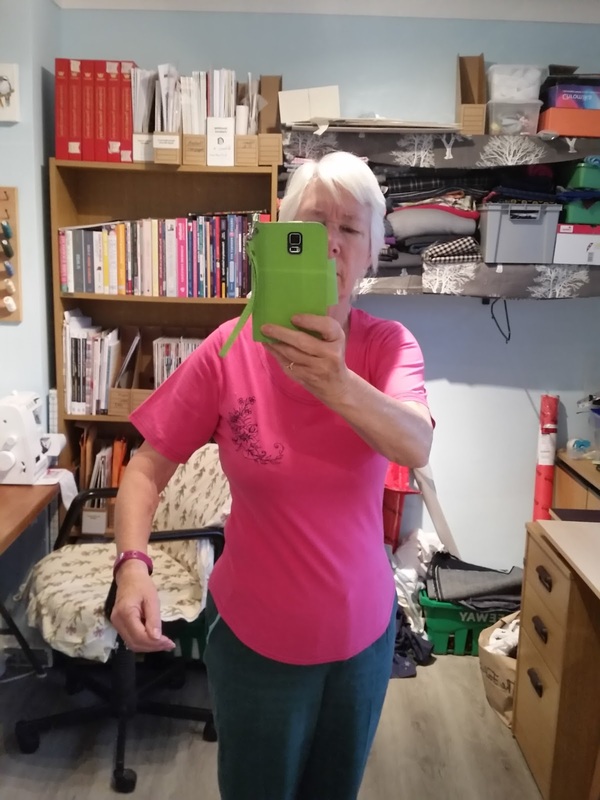 I also added length to the main body as I prefer to wear my T-shirts a little longer. My next attempt was far better and again I used some scrap fabric from my stash yet once more I was falling into the trap of plain old boring so I added an embroidery element to make it my own. The result is a much better fit [although I'm still not sure the sleeves are right] and matching the navy embroidery thread I used my cover stitch machine to finish the neckband, sleeves and dolphin hemline. I will wear this when the weather is warmer [a lot warmer!] 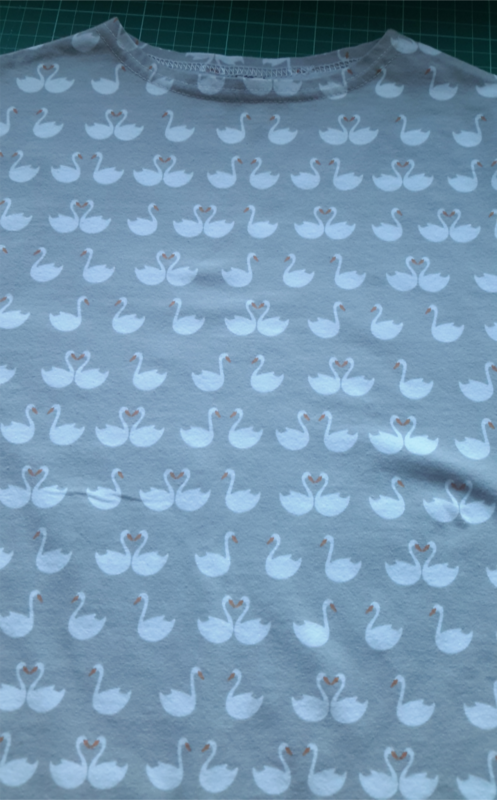 but I could have made this easily with SFD so I wonder why I bothered with this pattern. 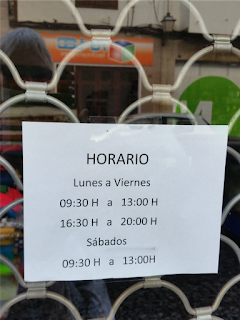 Maybe I just feel I'm missing out but have I got this all wrong? I didn't need a badly drafted, ill fitting, complicated method of construction to tell me I could have done much better without it. 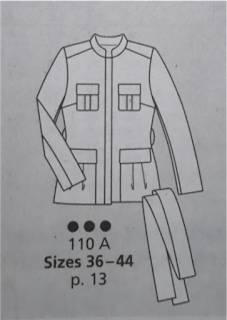 Next month the pattern is for a coat but I'm not going to rush for this one until I see what others make of it. 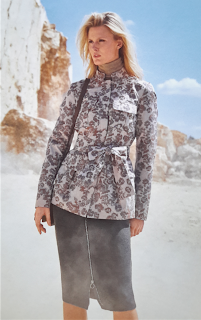 I have a lot of Burda Style and a few My Image Magazines with plenty of inspiration on offer. Well that's probably one of my New Year Resolutions out the window.... I've changed it to 'Stick to what you know but do it better.' Maybe that'll work! 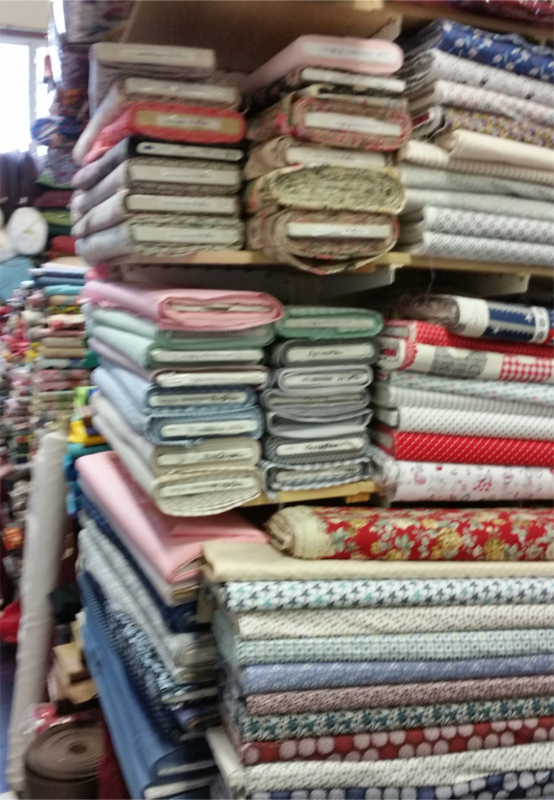 I follow a lot of Vlogging sewists and I've enjoyed their videos but not been tempted to enter this media as a general rule as I think blogging is good enough. Also I feel that at 70 I'm a lot older than the experts I follow and don't have the equipment, lights and quality camera etc. So that's my excuse, however I did do a quick video as the fabric was so lovely and drapey and a flat photo didn't seem to do it justice. There is no sound on this video so don't expect to hear me talking as well. As you can tell I'm not an expert film maker but I hope you get a flavour of the garments which is what it's all about anyway. The shirt is a lovely silky feel fabric with a good drape and suited this shirt beautifully. The colours include my favourite teal / turquiose and a soft caramel that is a little outside my usual choice. This is apparently close to the new trending colour for 2018 so at least I'm current and now it's finished I actually love the colour. 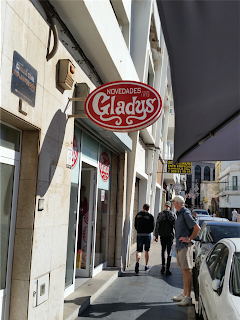 I had a tussle with it which I really shouldn't have. 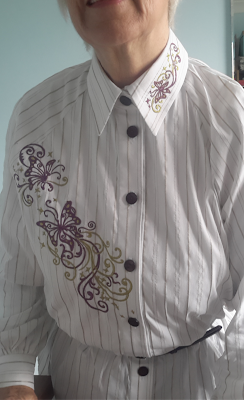 I've made this shirt many times before based on my SFD blueprint but I wanted to make it slightly different so in an attempt to make a seperate front button band using the grain crosswise I somehow manged to add too many seam allowances and ended up with the centre front being way off. I had to undo the bands and reposition them in the correct place. That was the first bit of unpicking. The next was the collar. 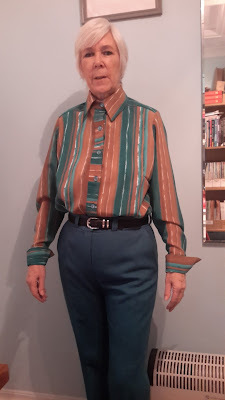 I had decided to use the fabric from the trousers to make the under collar and inside collar stand but that fabric was too weighty and didn't look good. It was perfect for the trousers but not as an accent colour. So the collar had to come off and luckily I had enough scraps to make another. On the finished garment you'll notice I changed the grain on the collar for the remake and I like it better so a good result in the end. I must admit my sewing has come a long way that I'm prepared to go to these lengths to get it right. A few years ago when I started making my own clothes I would have carried on and then hated the finished result. Now it's about being happy wearing my own makes and increasing my level of acceptable standards. The cuffs are designed to be worn straight down or turned back and again the grain was changed to add interest. The trousers were very straightforward again using my well tried SFD body blueprint so no surprises there, just a good fit and lovely fabric. I bought this linen type from a lovely shop in Bath when a friend and I visited a couple of months ago. 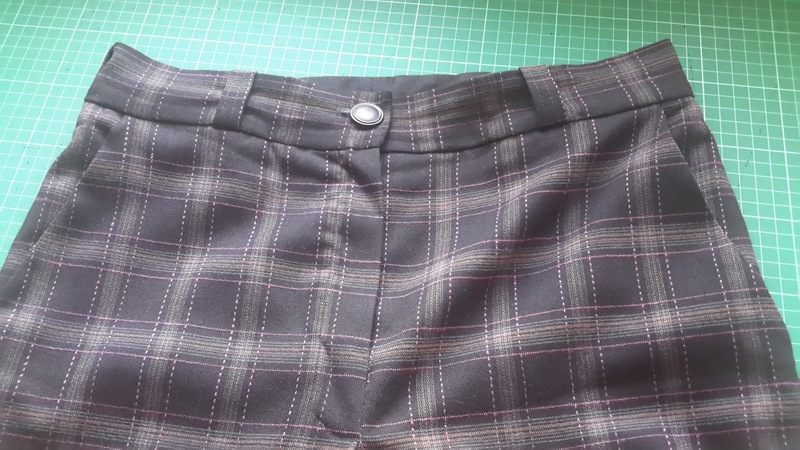 I didn't line these trousers as the fabric is has a good quality which looks and feels right without. It was my husband's big birthday yesterday and I'm pleased that despite the setbacks I got both pieces finished in time for his celebration dinner at our favourite restaurant. 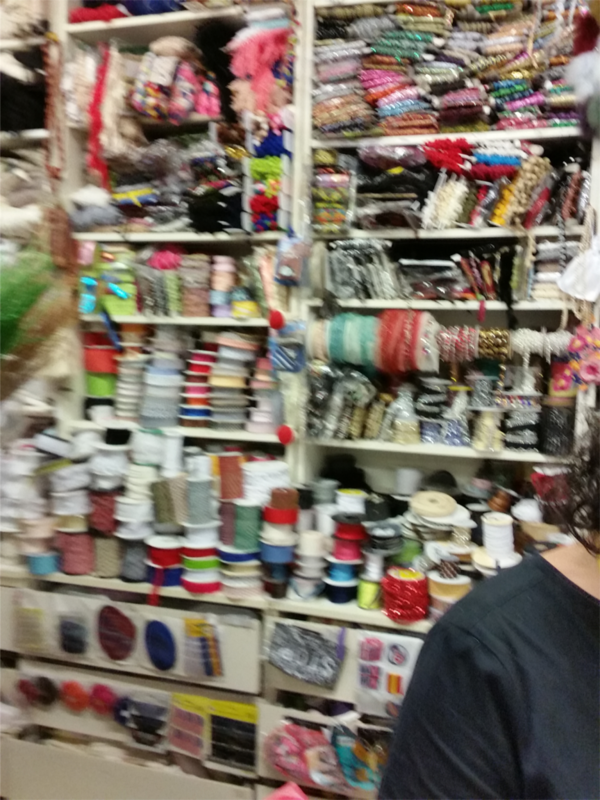 We all make mistakes and sewing is no different. I am not proud of this jacket and can't see me wearing it at all. It's such a disappointment from the vision I'd had in mind. 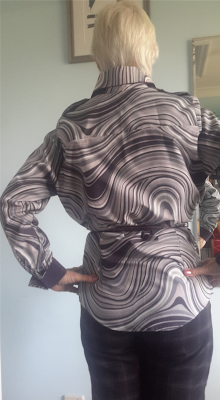 The design I chose was from the Burda Style magazine and the fabric was a wool I'd bought from the Cloth Warehouse sale a few weeks ago now. 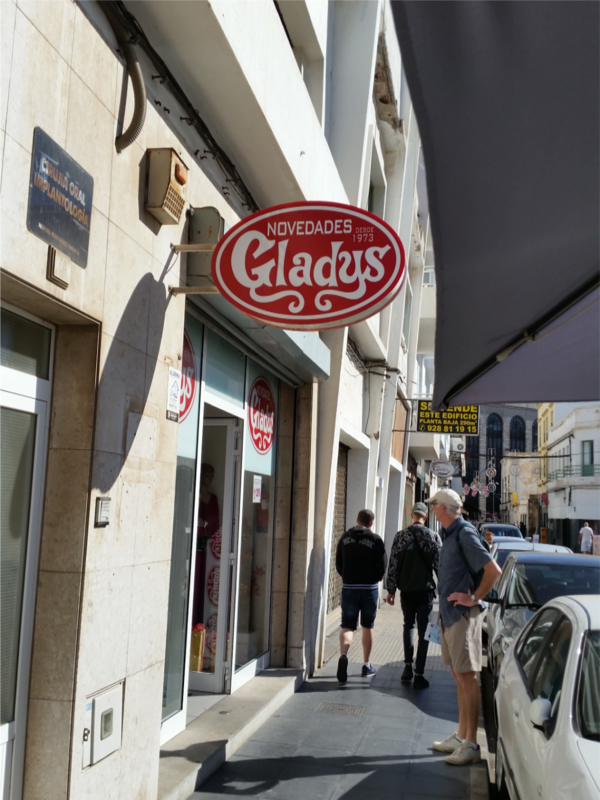 I'd had such high hopes but the result looks awful. I'm not sure what went wrong but when I put it on I feel like I'm wearing a Chinese Manadrin jacket from the workers revolution. 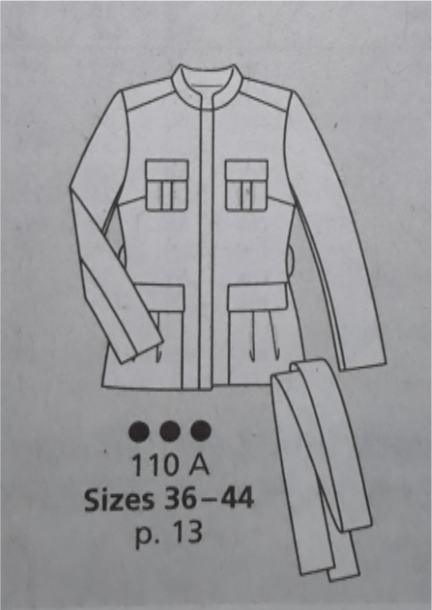 OK, the mandarin collar doesn't help but it was based on a Safari type jacket and the pockets reflect this but the overall result just doesn't do it for me. I'm upset because it wasn't an easy make. 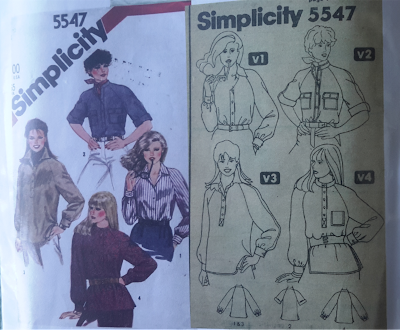 I struggled with the front pockets and with Burda's infamous ability to confuse the reader with unintelligable instructions at times. 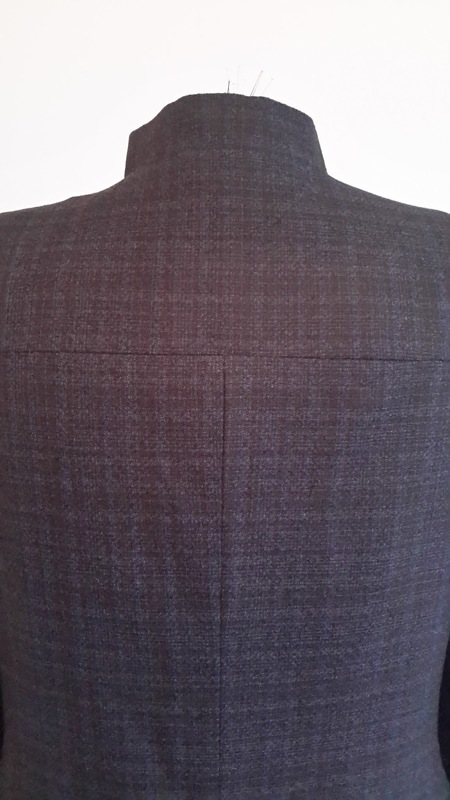 I loved the back yoke detail and I was pleased to master the back pleat as well as all the lining. 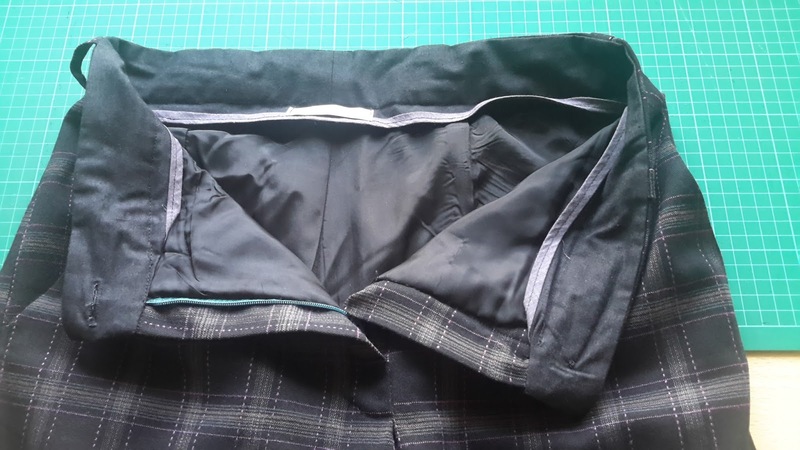 I took a lot of care over the construction and lined the jacket using the bagging method so a lot of new learning techniques. The problem when your garment doesn't turn out as you'd hoped is that you lose a bit of sewing enthusiasm. I find the best thing is to get straight back but with something easier and simpler that you've made before so it's well tried and guaranteed to give a good result. So that's what I did. Instant gratification. 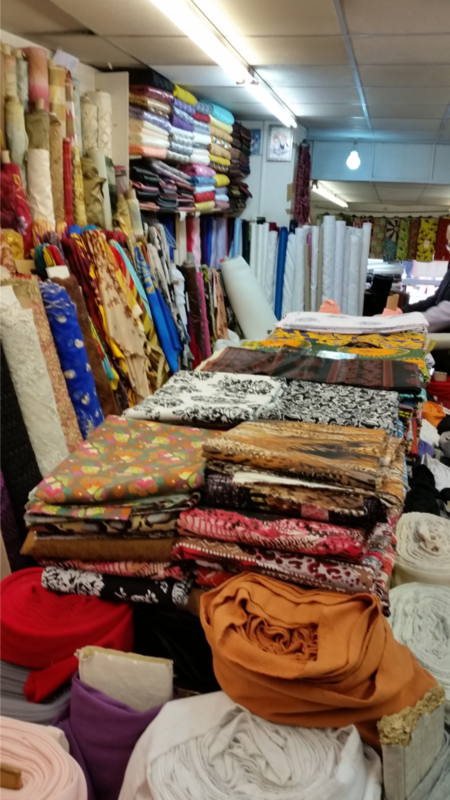 I hapened to be in Redhill on market day and the fabric stall had a medium weight border print fabric that caught my eye. At £2.00 a metre, I couldn't really go wrong. 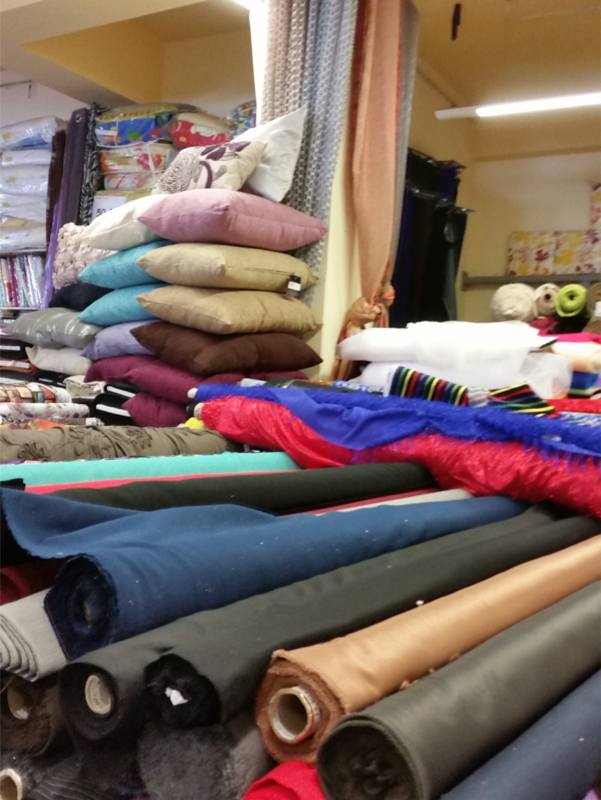 When the lady was cutting the 2 metres I asked for she noticed a couple of grubby marks so decided to give me the whole lot for just £2.00 instead of £4.00. I didn't argue and washed the fabric as soon as I got home. The result was pristine, not a mark anywhere. 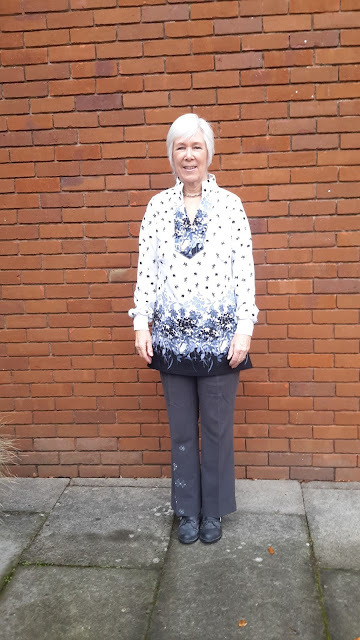 I decided to make best use of the border prnt by making a tunic from The Tunic Bible with the pattern I'd made a couple of times before. It took me only 4 hours to cut out and make and I'd got that lovely feeling of having made a striking, unique top to wear for very little money. 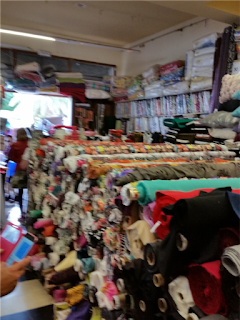 Sewing mojo is back. 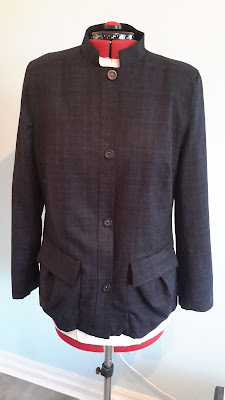 I teamed it with my grey trousers but it will also go with black and in the summer I will pair it with my white trousers. Here is a close up of the front facing. I'm glad I've moved on and I'm back in the sewing room. Thanks to Pat for taking the outdoor photos. 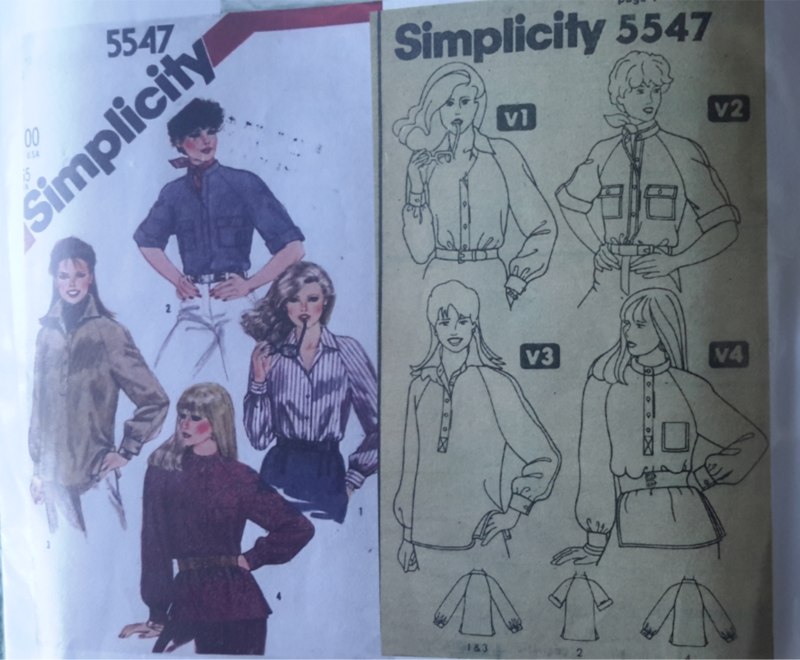 A very good friend of mine found a Simplicity 5547 pattern in a local charity shop and it looked very interesting being a shirt tunic top with raglan sleeves. 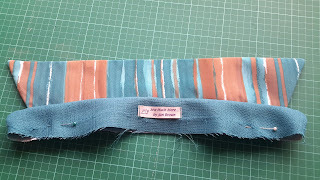 If you follow my blog regularly you'll know I've hardly ever used a pattern, preferring to draft my own using my body blueprint from SFD as a base. However, I liked the idea of the raglan sleeves so I decided to base the shirt on View 1 but added my own 'not so subtle' changes. 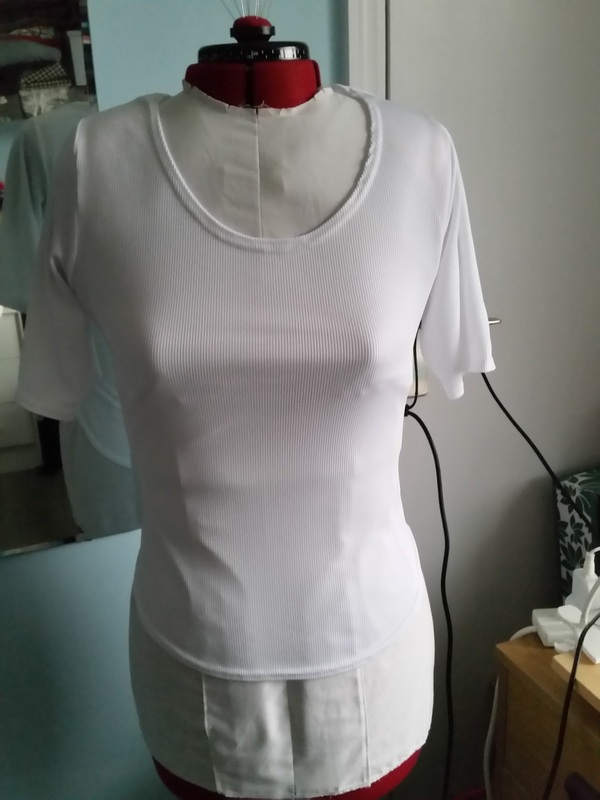 I've been wanting to make a plain white shirt for ages. A staple for my wardrobe that would go with anything and initially I thought this would be the pattern to use. I recently bought a couple of metres of Stretch white cotton fabric from Cloth Control for under £5.00 and it was a contender except that it had a gold stripe. 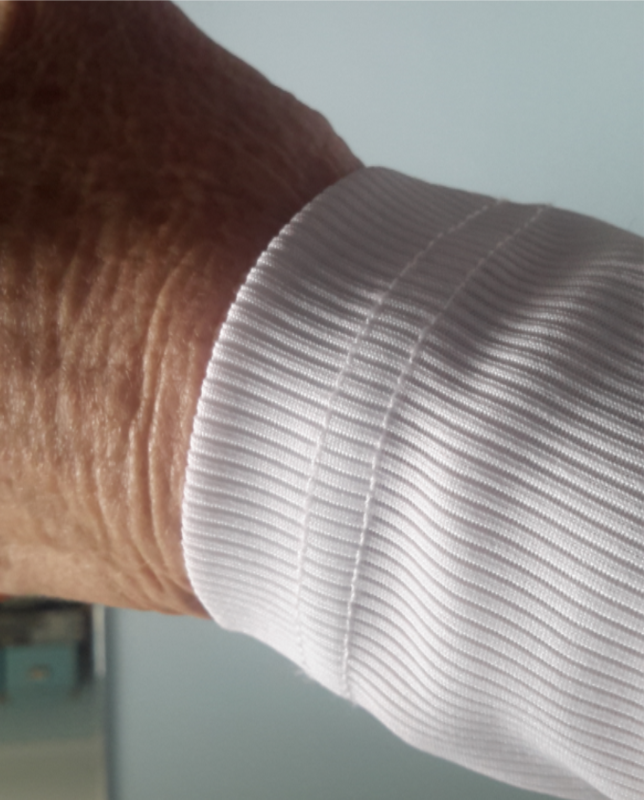 Nothing wrong with the stripe, in fact it is a beautiful design but it wasn't the plain crisp white shirt I'd envisaged. That will have to wait for the right fabric. For now it would do well for this pattern. 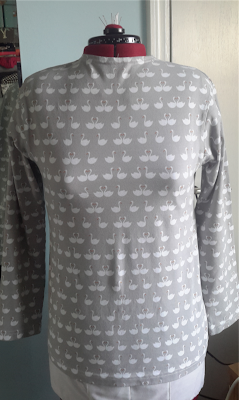 Well at least I thought it would.... Once I'd cut it out, I realised it was going to look like a nightshirt unless I did something dramatic to it. So I looked through some embroidery designs to brighten it up and this is what I eventually came up with. 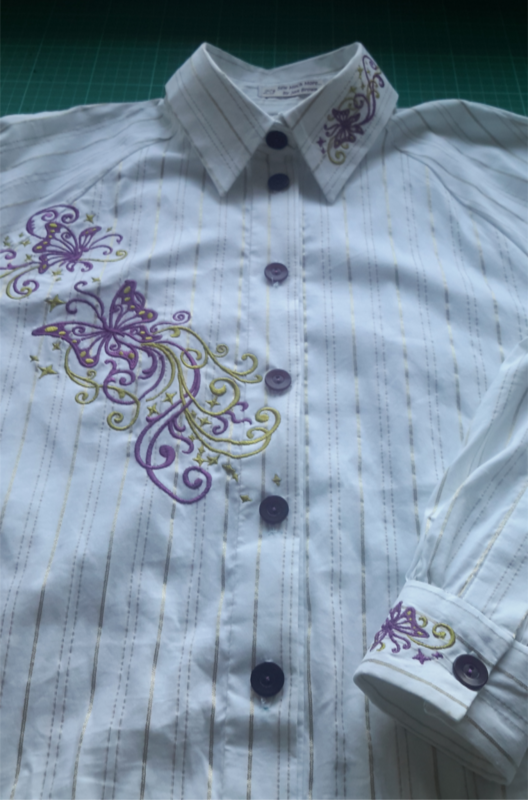 The design was put on the left cuff and the left collar point only with the main design across from the right shoulder. I added the coordinating buttons to hopefully pull the whole thing together. 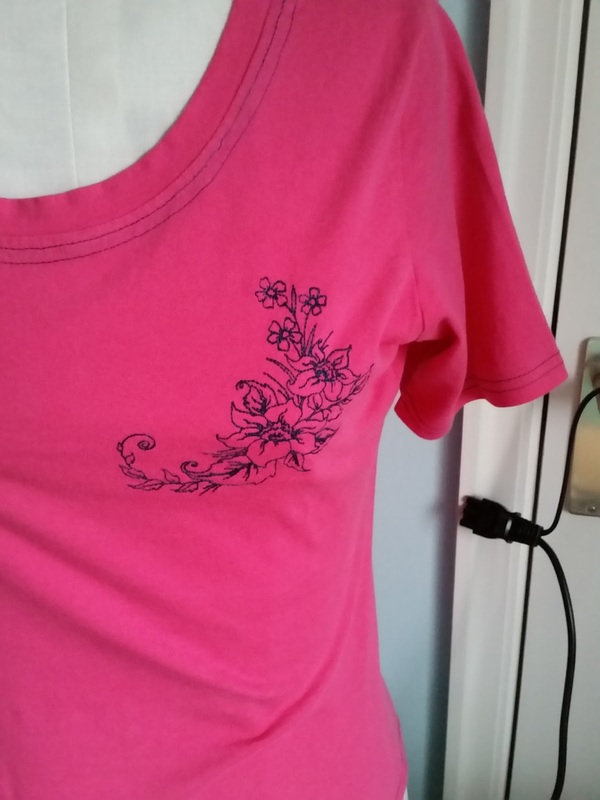 The actual shirt came together quickly after the embroidery was finished. 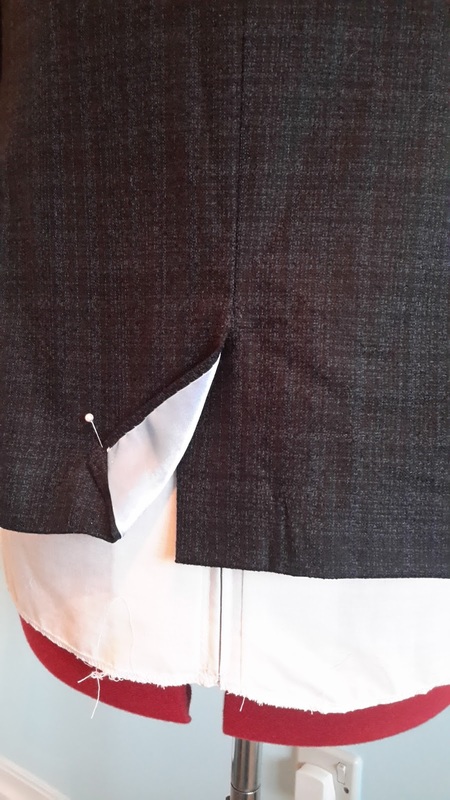 This part took a fair amount of time in the placement before construction and working out the order in which to make up the garment. 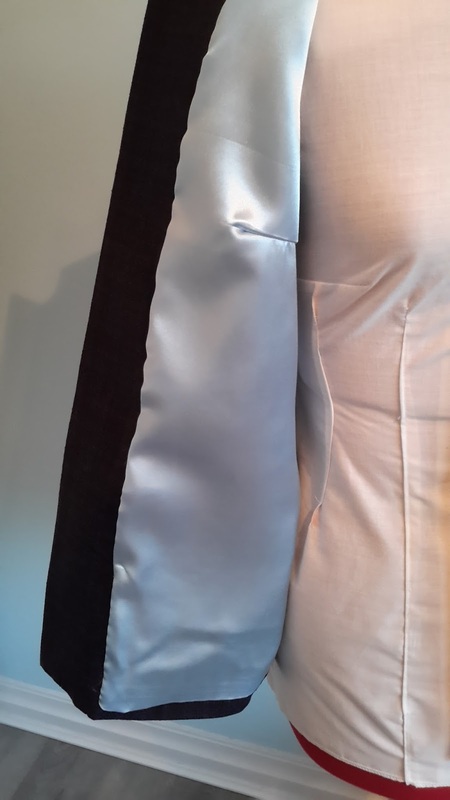 I wanted the design to start across the raglan shoulder seam and finish in the buttonhole band which meant I couldn't finish the band until after the embroidery. Once I was ready I decided that top stitching the bands in place would spoil the effect so I hand stitched the plackets in place. I am particularly happy with the cuff placket pattern matching and the collar was a perfect fit. 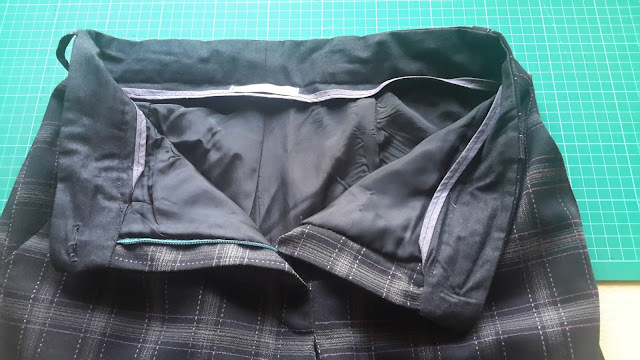 I also made the tails curve towards the side seams and put a couple of darts in the back to take up some of the bagginess. Overall I liked the pattern and I will probably make another at some point. I also made three other quick items during the week. Both were made better with the use of my coverstitch machine which is proving to be a brilliant addition to my sewing room. The first is a plain and simple rib long sleeved T-shirt to act as a layering garment in winter. The close up of the sleeve ends shows the coverstitch wide needle stitch. This gives a professional finish that is also very stretchy. 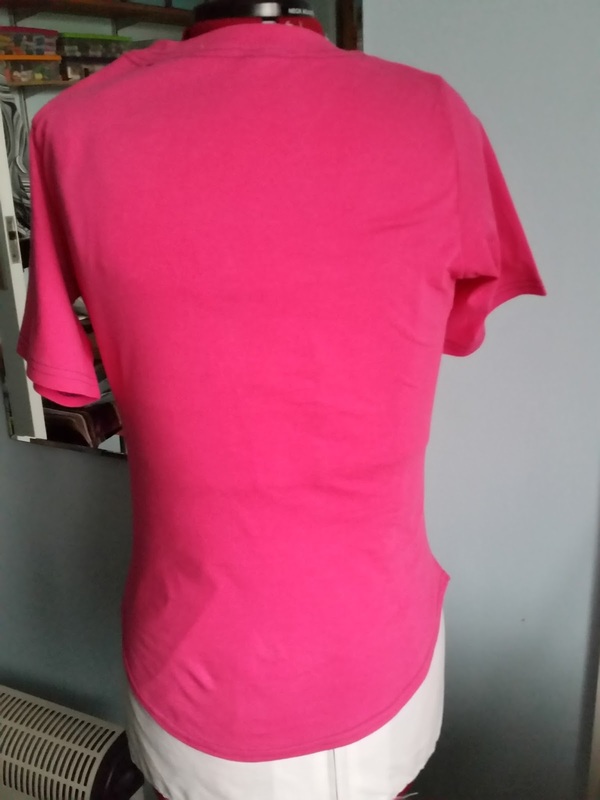 Next up is another T-shirt in a Ponte Roma knit fabric that I bought from a fabric shop in Bath during a recent visit. It is a beautiful soft grey with white swans and is very cosy and warm. 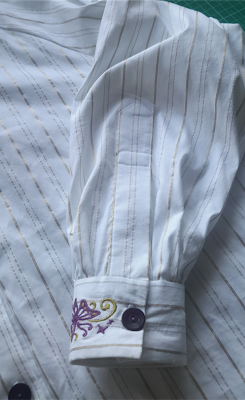 And lastly for this blog is a very quick nightie using the fabric I bought from a charity shop while we were on our trip to Australia earlier this year. I paid just AU$5.00 for nearly two metres of this butterfly flanelette fabric from Vinnies. 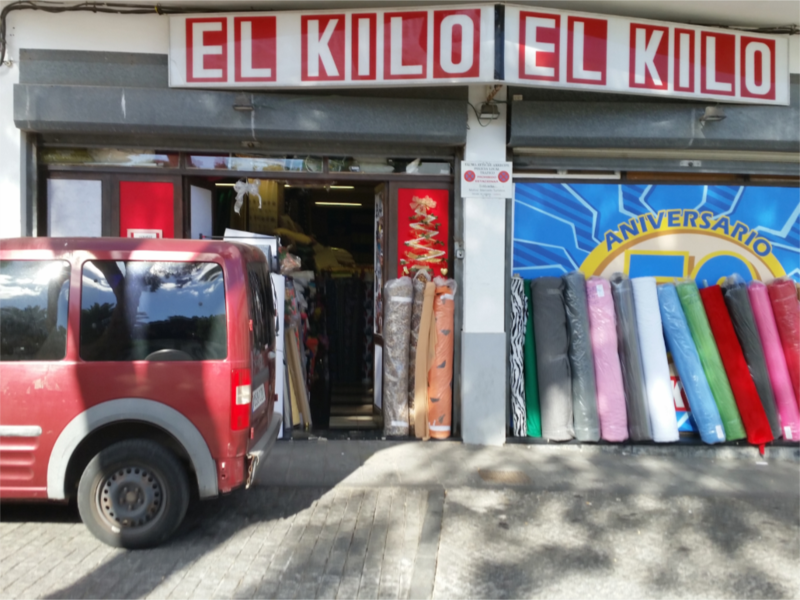 We had travelled south towards the blue mountains and found we'd hit a colder area than we had planned for so the fabric initially came in handy as an extra covering at night over the duvet in our rented motorhome until we moved north again and found some heat. Now it'll keep me snug once again during the UK winter and I shall dream about our wonderful adventures. All these three garments came from the same basic T-shirt design so were fast makes and not meant to be anything other than additions to my basic wardrobe. I have some fabulous blue / black wool suiting fabric from which I want to make a longish jacket so that will be on my cutting table soon. 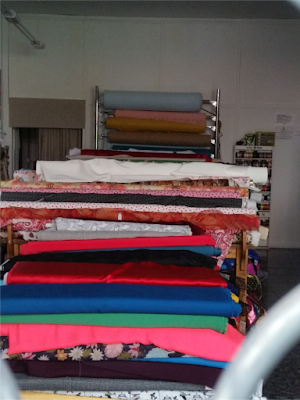 It seems the more I sew, the less I blog which is a bad situation to be in. Anyway here is my latest make but first, I'd like to share a recent birthday gift I received from a very dear friend and one of my biggest fans of my sewing and blogging. 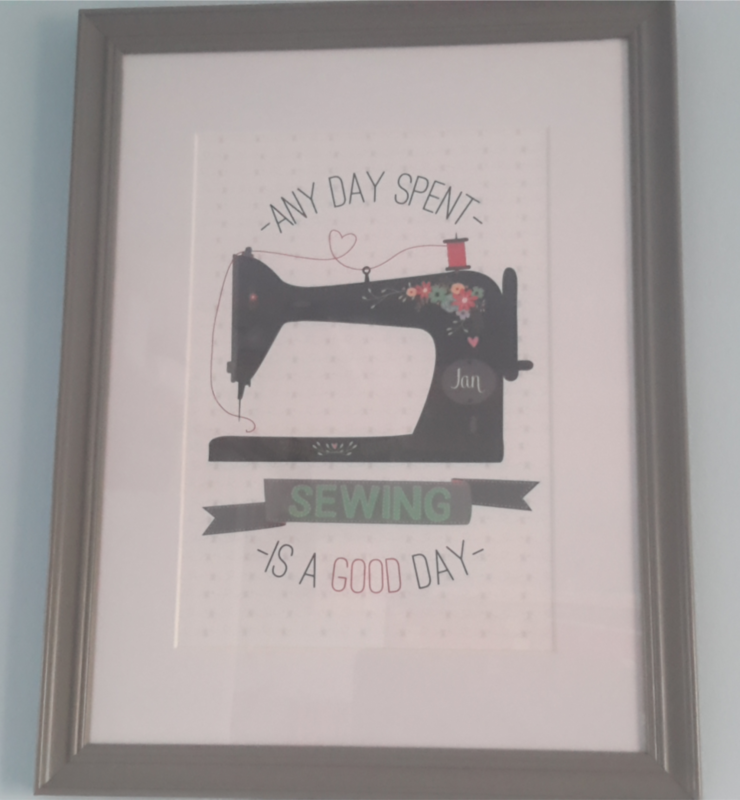 This was a big birthday for me and such a brilliant present that fits perfectly in my sewing room. The photo doesn't do it justice but the frame totally matches my curtains. The background of the picture is made of tiny thread reels and apart from the machine having my name on it you can see the thread on the machine loops up to a heart before threading its way down to the needle. I just totally love it. This was just such a thoughtful gift and so appreciated. I described this as a 'noisy' shirt to a friend who enquired because it's not exactly 'loud' but it isn't quiet either. The fabric reminds of those paper crafts where you dip it in liquid having spotted it with oils for some pretty amazing designs. 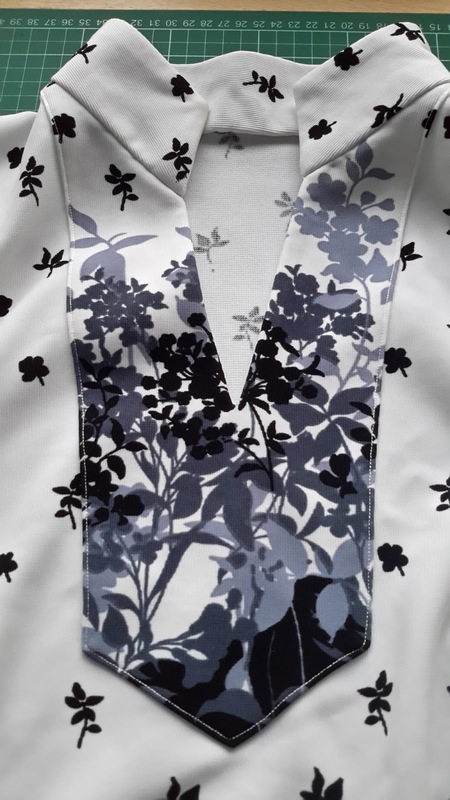 I can't remember where I got this fabric now but it's a quality 100% cotton and would have been too overwhelming in one colour so I used some accent plain fabric for the cuffs, shoulder tabs and inside of the yoke and collar. The collar came out a bit 'Elvis Presley ish' and wasn't intended but I know where I went wrong. 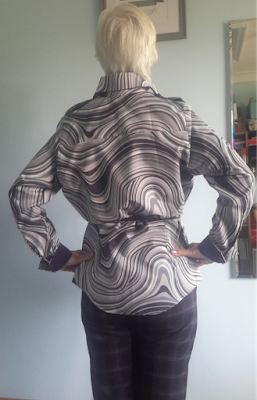 I drafted the pattern from my SFD basic body blueprint where I then added my usual 1 cm seam allowance but instead of drafting a new collar and stand, I took the pattern from one of my original drafts which I now realise used the old standard 5/8" seam allowance [employed in the early days of my sewing career until I followed more experience tutors who taught me 1 cm in most places is much easier than the larger one and then having to trim down after - made sense to me]. Anyway the colar is now referred to as a 'design element' but I'll be more careful next time. 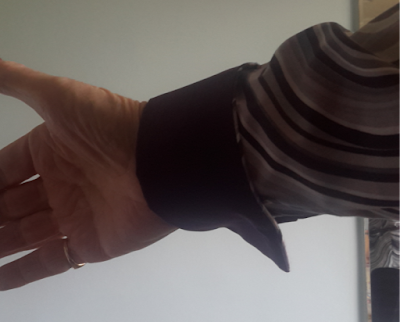 The cuff was another design element that I hadn't intended at the outset. I wanted the cuff to have the plain colour lining but I realised it would have more impact turned back in half. 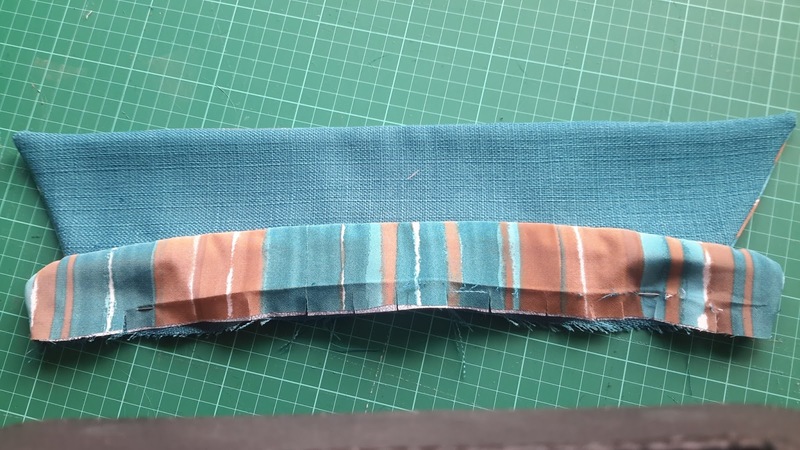 The only problem here was that being an afterthought I had already allowed for the 'turn off cloth' for the other way so there is a slight border effect around the edges which isn't very professional and certainly makes it look 'home made'. I've got a T-Shirt and some Yoga Pants for my new Tai Chi QiGong classes starting next month on my cutting table so that's my next project. Gosh, I have been doing a lot of sewing but not a lot of blogging recently so here goes with some catch-up photos. 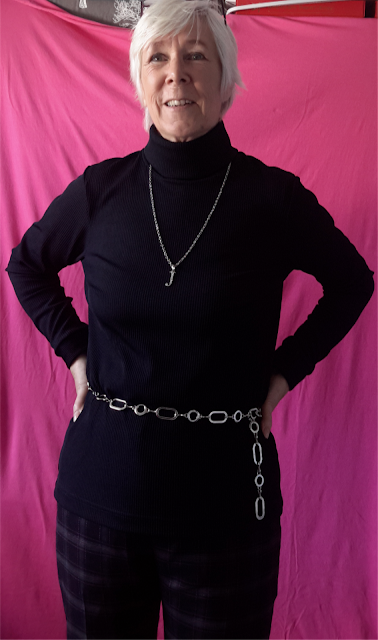 So first up is a polo neck top and check trousers. The black narrow rib top is fairly plain and straightforward using my basic T-shirt block. 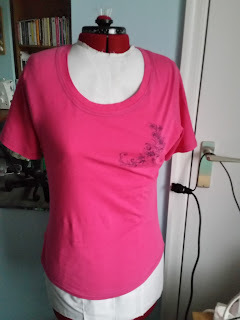 The real benefit was using my new coverstitch machine for the neckline and hem. I am certainly appreciating the way it creates a superb finish but still allows lots of stretch. A definite investment that has paid off in terms of a professional and comfortable finish. 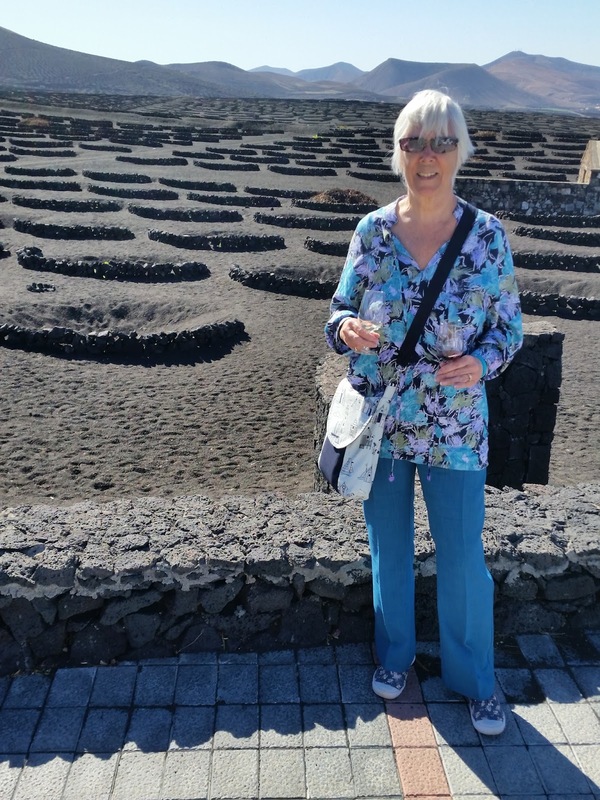 The trousers were from a block that I drafted from a new book bought for my recent birthday. I used fabric that I bought in Portugal during our trip last year but I made sure the pattern matched my SFD blueprint. 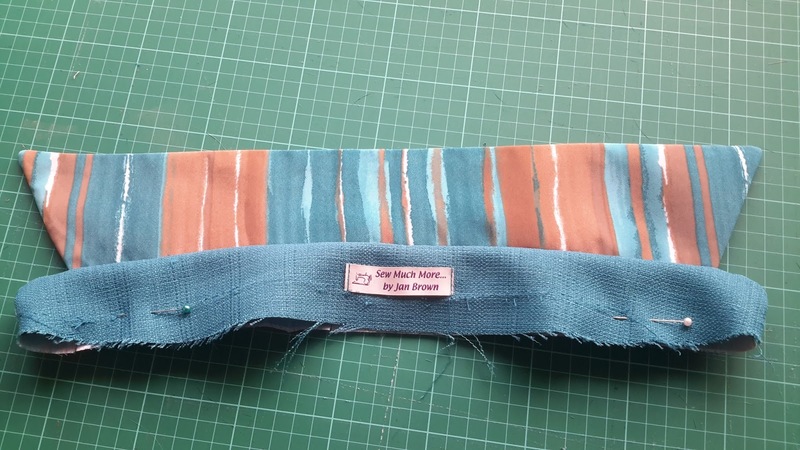 I made the belt loops by employing the wide stitch again on my coverstitch and it worked a treat. I want to make this pattern again with a beautiful teal linen fabric I have and initially this pair were to be a wearable muslin but they fit and feel so comfortable I think I should look at them as a pretty excellent garment in their own right. I lined them as I've blogged about before and this adds to the comfort factor. 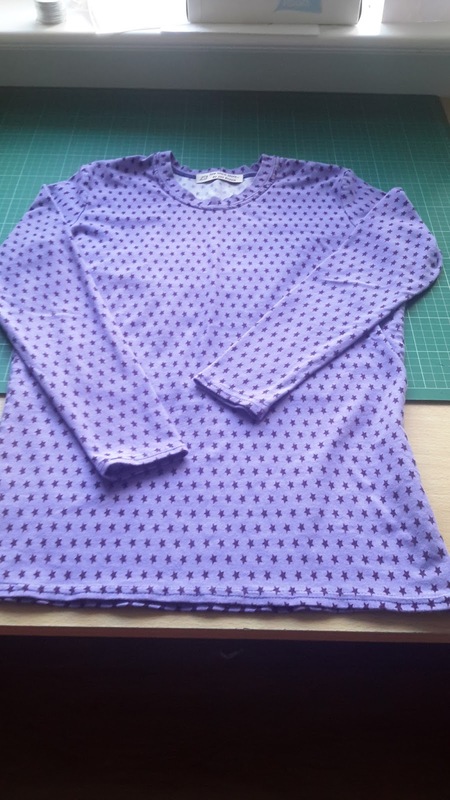 The lilac T-Shirt has purple stars all over it and is a firm but stretchy knit that will act as a staple in my new colour combo as well as acting as a layering piece in the winter. Next up is this tunic top and again I've employed the coverstitch to do the top stitching in a contrasting gold colour to emphasize the shoulder yoke detail. I'm not too happy with the neckline as I prefer a high neck or collar so my toning scarf dresses it up better for me. 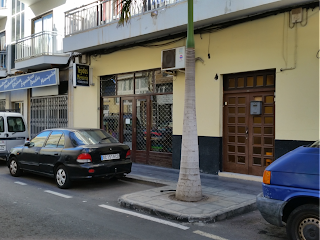 I have a few other pieces I need to 'show and tell' but I think that is enough for this blog. Keep a look out for the next installment when I reveal a shirt I made for my Husband and the set of Pattern Making books I referred to above.